Becker Campanion 10.5 BK2. This is the Becker Campanion 10.5. 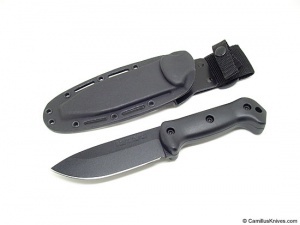 It's an illustrated knife entirely Black in appearance, and of full-tang construction. The blade is 5.25 inches long, made from 1095 Cro-Van carbon steel and given a heavy matte Black epoxy powder coating. Do you own Becker Campanion 10.5 BK2? Tell us about it! Have a question? Ask!